This was an experiment due to an excess of cheese in the fridge, mostly. I didn’t measure anything, so if you need precise quantities, I’m sorry… Bad blogger. But the ‘recipe’ is marvellously flexible and forgiving, so even if you’re a precision chef, give this a whirl. I started with cheese – about 300g of mixed cheese lurking in my fridge – a feta-like salty number, and rich creamy cheddary type (but choose your cheese – a salty one means you don’t have to add extra salt) chopped into smallish but uneven chunks (it will melt in the oven). About 300g of general-purpose white flour – I added another couple of shakes once the first lot was mixed, because the dry mix seemed to call for more flour. Two green chillis – one was bland, one turned out to be quite hot – chopped small. A couple of sprigs of fresh rosemary and some thyme; three cloves of garlic, crushed; two heaped tablespoons of sour cream (greek yoghurt would be fine), a bit of salt, a good grinding of black pepper. 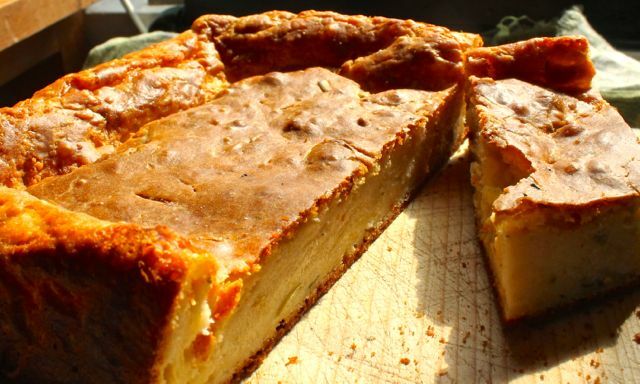 Add it all to the cheese and flour mixture and stir; whisk two eggs and add them to the mix, then pour in a slosh of milk and stir thoroughly, adding milk gradually till it’s a nice sticky heap – not runny, but not stiff. Malleable but not pourable. At the last minute add a 10g packet (two level teaspoons) of baking powder and mix in thoroughly. Line a tin of your choice with grease-proof (baking) paper, and pour in the mixture. Stuff into the oven on a medium heat and check after 50 mins – if it’s tanned and firm to the touch, it’s ready. Eat while warm, or if you’re patient, let it cool. Great with soup, salad, or a treat on its own. Try not to sneak down to the kitchen at midnight to scoff the lot. If you ever wondered how to make a filling, hearty, scrumptious and attractive meal from a few roots and a bit of cabbage…. to satisfy even the most carnivorous of people, read on. I had lot of root veg in the house, so for supper tonight I chopped sweet potato and half a butternut squash into chunks, turned them in oil and mixed herbs with a heavy pinch of chilli flakes, and bunged them in the oven on top heat. So far, so good. Then it was the spuds – peeled, chopped and boiling, they toiled away while I peeled garlic and got Rich to pick parsley and chop it very finely. Jules was shredding red and white cabbage, meanwhile, and I was eyeing up the spice shelf. When the spuds were soft, I drained them, pressed four garlic cloves into the steaming pan, added a sizable chunk of butter and a slosh of milk and mashed their socks off before dropping in the parsley for a final stir. The cabbage was boiling hard for three minutes while the parsley was making the mash look pretty; then the cabbage was well drained and put back on a gentle heat. Three heaped tablespoons of sour cream, half a teaspoon of nutmeg and a generous shaking of paprika, lots of black pepper, and a thorough stir to coat and colour the white and purple shreds… and it was all ready. 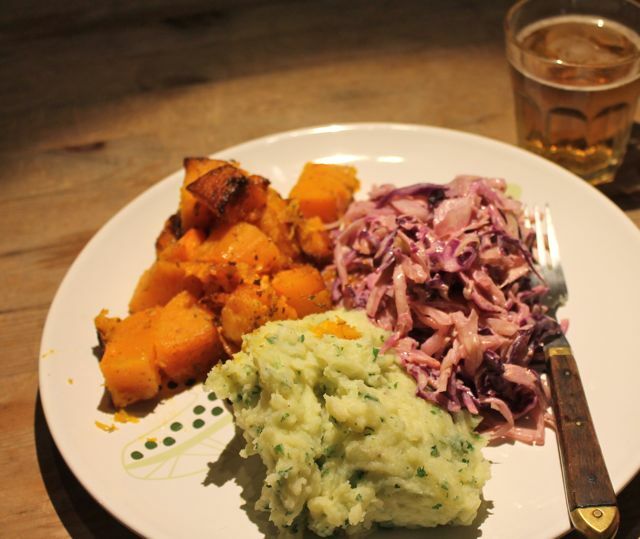 The variety of flavours – sweet roots with an aromatic herby savour and the bright warmth of chilli; earthy mash with tangy garlic and parsley freshness, and the wonderfully complex spicy, creamy cabbage… contrasts that complemented perfectly, and won compliments. The colours and textures, too – I’ll definitely be doing this combo again – an off-the-cuff experiment that worked perfectly. It would be great for autumn and winter, and wonderfully cheap. Spuds, roots and cabbage, with a bit of spice and cream to add the luxury. Can’t be beaten. Easy? Yes – nothing complicated, just some chopping and seasoning to think about. When I get a visitor with food needs I haven’t met before, it’s a challenge I love. This week’s visitor eats meat, but has allergies to dairy and gluten. No dairy, no problem, but no gluten (wheat, oats, rye, barley) is a restriction I haven’t catered for yet. 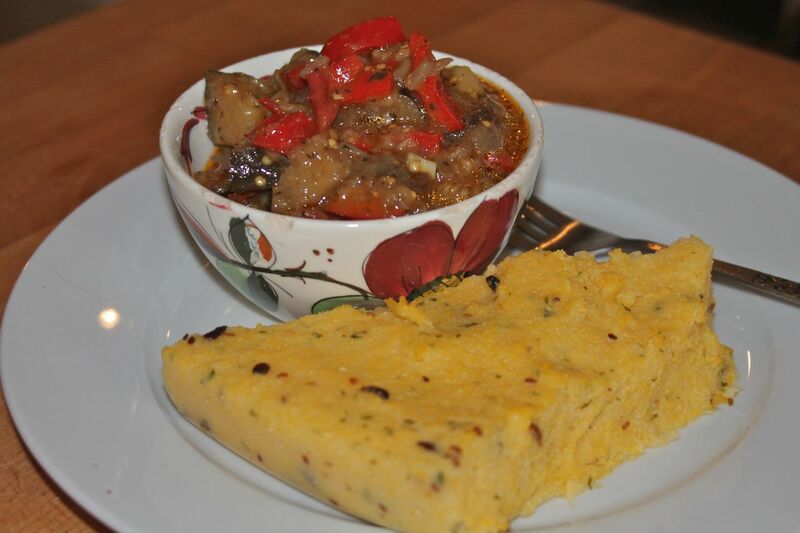 Mamaliga is the Romanian word for polenta, and is a staple food here. I find it – as normally served – like wallpaper paste, tasteless and gluey. but with a little extra something, then sliced and grilled, it becomes something altogether different. Boil a kettleful of water and pour half into a large pan on full heat – when boiling, add the dry polenta/maize meal and stir vigorously (use a whisk to get rid of the lumps) for 15 mins or so (follow cooking instructions on packet), topping up with water as polenta thickens. Add the toasted seeds and the parsley, and a salt to taste – check seasoning several times. You want the polenta thick, but still pourable. When it gets to that point, pour it into a shallow dish and let it cool while you cook the veg. I call this Arthritis Relish because it consists of all the veg that do no good for arthritic hands – but they’re all so delicious I put up with a couple of days of discomfort. 1 aubergine (eggplant) – cubed into 1” pieces, skin on. Put all the ingredients in a big pot with plenty of oil (extra virgin olive, for preference) and frazzle slowly for at least 45 mins, so the aubergine has softened thoroughly and tastes sweet and rich. Check flavours and adjust seasoning if needed. When cooked down to a jammy chunkiness, take off the heat and keep the lid on the pan. On each plate: a slice of polenta, a scoop of Mediterranean veg, something green and leafy, and perhaps some crumbled feta cheese or grated Pecorino, and a good twist of black pepper. NB There should be polenta left over (it’s very filling) – a grilled slice works very well as breakfast, topped with scrambled, poached or fried eggs, mushrooms or grilled tomatoes. And/or bacon, if you’re so inclined. Jaggery or “Gur” or whole sugar is a pure, wholesome, traditional, unrefined, whole sugar. It contains the natural goodness of minerals and vitamins inherently present in sugarcane juice & this crowns it as one of the most wholesome and healthy sugars in the world. It Mexico & South America, it is also known as panela. Jaggery, being a wholesome sugar, without doubt is rich in the vitally important mineral salts: 2.8 grams per 100 grams, that is to say 28 grams per kilogram, while only 300 milligrams per kilogram is found in refined sugar. Magnesium strengthens the nervous system & potassium is vital to conserve the acid balance in the cells and combats acids and acetone. 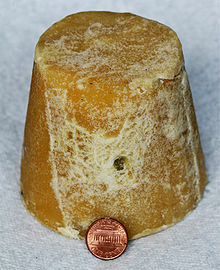 Jaggery is very rich in iron, which, a composite of hemoglobin prevents anemia. So why are we being sold fancy sugars and sugar substitutes instead of this simple, natural, healthy and cheap-to-produce stuff? Because there’s no profit in it? Because… why on earth not? Refining – even filtering out the ‘unwanted’ bits – can remove the very substances that keep the balance of health in foodstuffs. I’m not saying that diabetics could chuck their regimes and munch jaggery to their pancreas’s content, but we should look very hard at the refining and processing of basic foodstuffs. All right, all foodstuffs. Who’s with me? And where can I get hold of jaggery? (in the UK, Romania, Hungary, Germany or Belgium)? 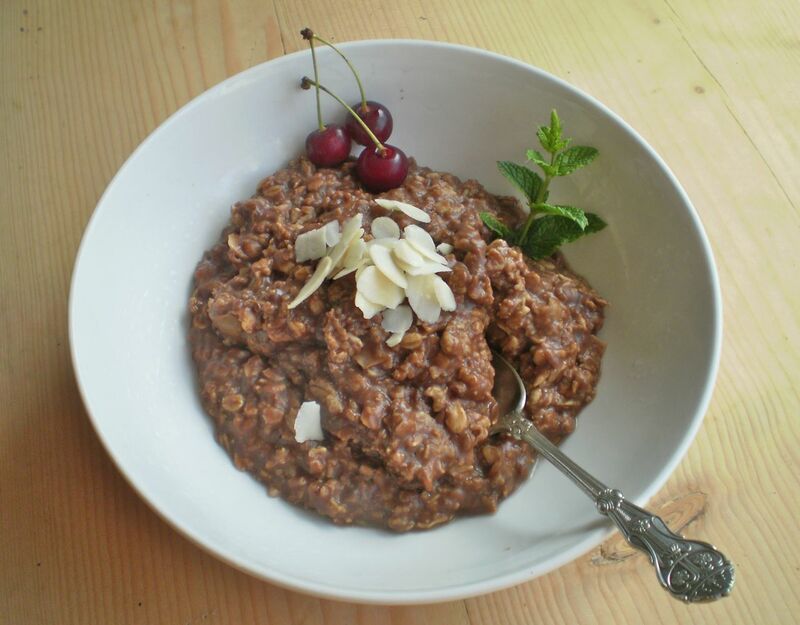 Good-for-you chocolate oats – what better to perk you up when you need it? This morning I wasn’t hungry, so breakfast (unusually for me) was just a cup of coffee. I felt a bit bleurgh, a bit soggy. Not enough sleep, a bit too much stress… you know how it is. But around 11.30am I was feeling a bit light-headed as well as soggy, so although still not hungry, I knew I needed something. Oats. Easy, quick. Boring. But jazzed up with gusto (did you know that ‘gustos’ in Romanian means taste or flavour? from the Latin, of course…) and rude health, I’m waiting for the zing to zap through me any minute now. For oomph, the oats. For pick-me-up yum, organic cocoa. For zing, cayenne. For zap, cinnamon. For vim, raw cane sugar. For vigour, flax seeds. For a bit of extra zing, a sprig of mint. Needless to say the closer you can get to home-grown, organic, free-range, etc, the better. In this picture the mint is from my garden and the cherries from my orchard. The rest is from packets, but organic packets. If organic, home-grown etc is out of reach, then it’s still a pretty damn’ good indulgent health-kick. Put it all in a pan and bring gently to the boil and simmer till it all goes gloopy. Add a bit more water if it needs it. Should be no more than 10 mins. Decorate with a sprig of fresh mint and some fruit – cherries, strawberries, pear, raspberries all go well. Add a few flaked almonds or chopped hazelnuts if you like, and top with some milk or a slug of double cream. PS I’m feeling the zap and the zing already. PPS This does at any time of day – breakfast, brunch, lunch, tea, supper or midnight snack. As well as or instead of – a purely pleasurable pick-me-up. PPPS Oops – I forget to mention the coconut. Half a handful of organic unsweetened coconut flakes gives you lots more health benefits, a bit of extra bite, and a subtle extra flavour. I love risotto and pilaf dishes, which are endlessly versatile, easy to cook and easy to eat, gentle on the pocket and as healthy as you like. Last night I was running out of fridge potential. A shopping trip is looming, today or tomorrow, but there’s still plenty to work with, despite the almost-empty fridge. One of my perennial store cupboard ingredients is pearl barley (barley – arpacas – in Romania, pearl barley in UK). Cauliflowers are cheap at the moment, and high on the simple-to-prepare-and-cook chart. Tinned tuna is always on standby. How: Boil the barley. This can take about 40 mins or a bit longer, depending on the eficiency of your stove, so put the barley on and go and do something else, because everything else takes 10 mins. When the barley’s done, drain and put the lid back on the pan to keep the barley warm. Put a little oil in a pan (or drain the oil from the tuna, if canned in oil. If canned in brine, add that to the oil in the pan). Wash and chop the cauliflower into bite-sized pieces and lob into pan. Sizzle gently for 5 minutes, then add the tuna, seasoning and most of the herbs (eg basil, thyme, chives) and sizzle for another 5 mins till cauli is done to your preferred balance of crunch/tender. Stir in the barley and serve, topping with the rest of the chopped herbs. If you like a bit of yoghurt on top, a spoonful or two is good, but naked is also good. Healthy stuff: cauliflower, esp if not overcooked; tuna, herbs. I have no idea of the health value of barley, but it’s a whole grain without the gluten of wheat. One of my top comfort dishes from childhood sounds unlikely, but it’s scrumptious, and rather pretty. Simmer the chicken in water until the meat almost falls off the bone, and you have a good chicken stock as well. Cook the rice (when I was a kid, it was white long-grain, but I now prefer brown basmati) as per packet instructions. Cook the beetroot – boil it (scrubbed but skin on) or roast it (peeled and coated in olive oil and herbs). This takes the longest (over an hour), especially boiling. Put the beetroot on at the same time as the chicken. Make the white sauce (what the French call Sauce anglaise): oil or butter in a small pan, with enough flour to soak up the oil/butter. Cook gently over a low heat for two or three minutes till the oily flour mix bubbles and looks like a honeycomb. Add milk and whisk to blend it with the flour and butter. Keep adding milk as the sauce thickens, until you get to the consistency of double cream. Season with a bit of salt, black pepper, perhaps a few chopped herbs eg basil and thyme. Keep stirring and if you get lumps, whisk in the pan till smooth. If the sauce is ready before anything else, you can turn the heat off and leave it till it’s all ready to serve. Once the chicken, beetroot and rice are done (all very forgiving if your timing is a bit out of sync), take chunks off the chicken (carving is a bit redundant as it’s so eager to part with the bone), put on a bed of rice with a serving of beetroot, drizzle white sauce in an artistic fashion (or, as I call it, a blanket), and eat. Green salad makes it look even prettier. Not low-carb or low-anything much, but the beetroot’s fabulously good for you, and it’s a meal that leaves you comforted and cheered. The chicken stock is brilliant for soups and sauces for several days. The juice from boiling the beetroot is full of minerals, so drink it, or add it to veg soup. Don’t waste it!